In the event of a storm, our crews go to work immediately, keeping in mind that their safety comes first. 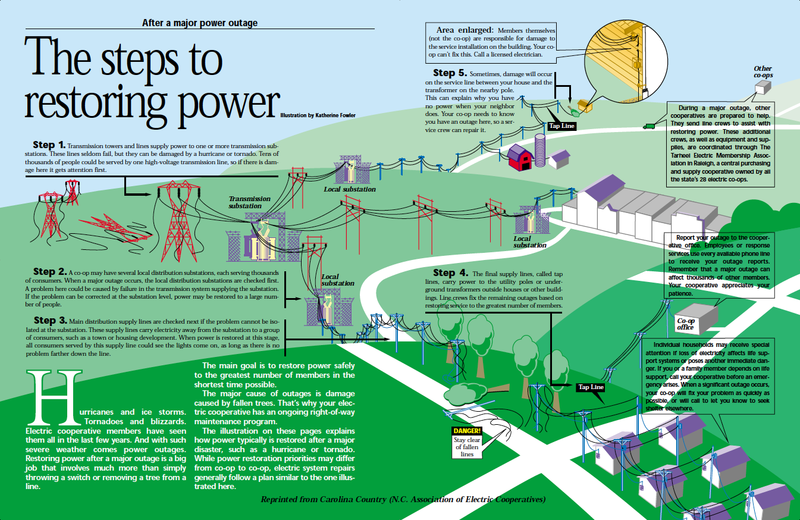 The first step is to restore power to as many people as possible. We do this by first restoring power to transmission lines and substations. Next, our crews work on restoring power along main circuit lines. In rural areas, these lines stretch for miles along roads into rural areas and across fields. Taps that lead off the main circuit lines are repaired next, and, finally, crews repair individual service lines to homes. Homeowners have a responsibility for repairing the equipment and wires that interface at their home with our system, such as their service entrance. Be assured, all employees work long hours during large outages and they too, want power restored as quickly as possible. Safety and well-being is a concern for our employees. Laws necessitate and regulate that employees get regular sleep and meals during major outage operations. Pioneer Electric contracts with Security and Response Services to provide after-hours dispatching that operates 24 hours a day, 365 days a year. Pioneer Electric constantly monitors all substations, gathering real time data to alert us of any substation or circuit problems on our system. All employees are utilized during crisis situations. We have agreements in place with other Kansas utilities, cooperatives and contractors for mutual assistance in times of crisis. Manpower and materials are transferred rapidly to our area when needed. Pioneer Electric makes continued efforts to increase service reliability and improve our facilities. We are involved in a constant study of trends and new developments to ensure dependable service to our customers at the most economical cost. First, check the fuses or circuit breaker. Then check your neighborhood to determine if the electricity is off in your area. If the area electricity is off, call Pioneer Electric and report it by calling 1-888-551-4140, 24 hours a day. Decide what equipment you want to operate when the power is out. This information gives you a clue on whether to choose a portable generator or permanent backup system and the size of generator (wattage rating) needed. Always locate your generator in a well-ventilated area. Be sure the total electric load is within the manufacturers rating. Use an indoor/outdoor, grounded (three prong) extension cord, properly sized to carry the electric load and keep it out of the way to prevent someone from tripping on it. Never plug your generator into an indoor or outdoor home or business outlet. Don’t overload your generator. Remember, more power is needed to start appliances, particularly those with a motor inside, than is needed to keep them running. To be sure your generator can handle the load, check the owner’s manual. Permanently installed generators are connected to your electric system and must be installed in conformance with the National Electric Code, Article 700-6 and Article 230-83. It is imperative that your permanently installed system be set up to ensure that when you are operating your generator, your system cannot simultaneously be connected to our system. This is accomplished through the use of a double-pole, double-throw transfer switch. To ensure your personal safety and proper transfer switch application, Pioneer Electric recommends a bonded and licensed electrician for installation. Or, if you have questions, please discuss your electrical plan with an electrician.